We regret to report the death of Alison Schofield, who died on 5 May 2012, aged 83, following a short illness. The following is the obituary which appeared in the Farnham Herald dated 25 May 2012. A military funeral took place at St Thomas on the Bourne Church on Tuesday for a former vice principal of Farnham College and popular head of languages at Farnham Girls Grammar School. Alison Schofield, before becoming a teacher, spent nearly 12 years as a commissioned officer in the regular Army, rising to captain. She died on May 5 aged 83, following a short illness, just a few months after a skiing holiday with her husband, John. Educated at Croydon School for Girls during the war years, Mrs Schofield (nee Senior) earned a degree in Spanish and French at the University of Durham and later, as a mature student, an MA in Hispanic studies in London. On leaving Durham, where she had belonged to the university OTC, she attended the Women's Royal Army Corps school of instruction at Guildford and was commissioned as a lieutenant in 1953. Attached to the Royal Signals, she was posted to Orsett in Essex where she met John, who was also in the Army. Subsequent postings included commanding the TA unit in Worthing and with NATO in Germany during the Suez Crisis. Then, having married John in 1957, Mrs Schofield became the first OC of 251 Signals Squadron in Aldershot and their association with Farnham began. After resigning her commission to raise a family, she taught languages in several independent and state schools locally and was head of languages at Farnham Girls Grammar School in 1973, when it amalgamated with Farnham Grammar School to become Farnham College. She was responsible for introducing Spanish at both FGGS and the college, was responsible for twinning with a French school and took parties skiing in France, Austria and Spain. After 'retirement' she taught part-time at Pierrepoint, Frensham, and put on her Army uniform again to take charge of the Army Cadet Force there. An active member of the WRAC Association at Aldershot, when the branch folded she stepped in to make sure the same did not happen to the Winchester branch, taking on the roles of president and secretary. "She was always selflessly devoted to others. Whatever job needed doing, she was the first to volunteer," said John Schofield. 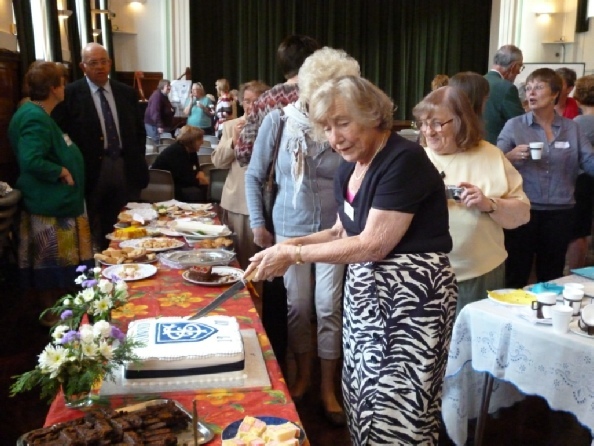 For 25 years she was the local representative for the Ski Club of Great Britain. She also served on the committee of Farnham's WI Market, was president of the Old Girls' Association of FGGS and, a keen tennis player, was involved with the Bourne Club and Frensham Tennis Club. Elected to the National Council of the WRAC, she was active in organising reunions and on benevolent fund committees. As well as skiing, she and John enjoyed breeding cats - British short-haired creams - and supporting village cricket at Brook, where her grandson played. She worshipped at St Thomas on the Bourne where John has been a member of the choir for 51 years. At the funeral service, attended by many serving and retired officers and members of the organisations she was involved with, Mrs Schofield's coffin was draped with the Union Flag and the colours of the WRAC and Signals were laid at the altar. Burial followed at Aldershot Military Cemetery.